New greatly updated tutorial in new post with NodeMCU dev board and ArduinoIDE. A lot simpler approach. Update with deep sleep now in new post. Testing the battery operation time in progress. Updated the connection drawing with updated Fritzing part of ds18b20 with correct pin order also in the breadboard view. In the schematics the part was wired properly all the time. Note: don’t trust computers. 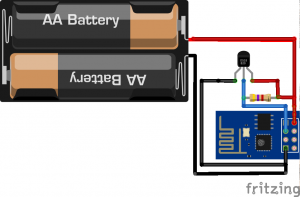 Simple temperature logger for your wifi surroundings is actually quite simple. Nodemcu firmware for ESP8266 is quite easy to work with. There is a module to interact with 1-wire temperature sensor readily available. To set things up you also need a TTL converter, for example USB To RS232 TTL PL2303HX Auto Converter Module. 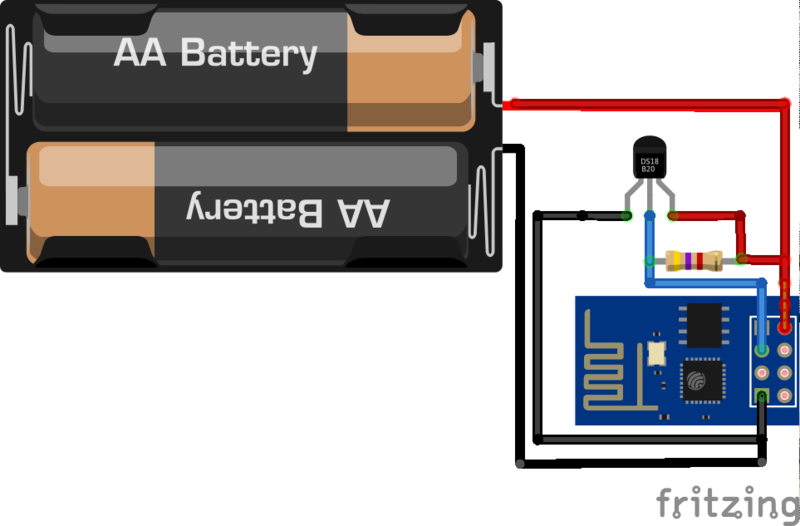 What you first need to do is connect ESP8266 to the ttl converter, 3.3v to VCC, GND to GND, RX to TX, TX to RX. And to enable the esp8266 you also need to connect CH_PD to VCC. After this you should be in a state where you can communicate with esp8266 using a serial console program and AT commands. After successful start the first thing is to get NodeMCU running on the ESP8266. To flash new firmware to ESP8266 you need to boot the ESP8266 in upload mode and write new firmware, NodeMCU. Just connect GPIO0 to GND for upload mode and start flashing. More on flashing. After flashing rebooting the ESP8266 without GPIO0 connecter should bring up some version strings to the serial console stating NodeMCU. This is good news as then all needed to do is to wire up the ds18b20 and upload init.lua and dallas.lua scripts. You also need to upload lua 1-wire -module (ds18b20.lua) to ESP8266. Good tool to deal with ESP8266 and lua-scripts is ESPlorer. It lets you run scripts, upload files, run snippets and do bunch of other useful things with your ESP8266. Before uploading init.lua set up your wireless network credentials. And before uploading dallas.lua set up your API-key for thingspeak.com. The lua-scripts are in github. I’d appreciate some guidance as to how to fix it. Hi, I would like to first thank you about sharing this nice topic. Do you have any idea regarding hte battery life. ? The code as-is is not optimized in any way to preserve energy. Running it with a powerbank containing 2*2800mAh 3.7v lithium cells it did run for 5 days. With those AA-batteries it depends on the batteries but I would say something along the same lines. I never did prolonged testing with that code and AA-batteries. Might be true. Feel free to fix it and publish the outcome. The example code is used for indoor temperature logging so no testing with negative temperatures. Pystyykö tuohon kytkemään useamman ds18b20 anturin? I looked the code at https://github.com/nodemcu/nodemcu-firmware/blob/master/lua_modules/ds18b20/ds18b20.lua and came up with thought that other free GPIO-pins could be used too. To the script of the previous link should be just programmed a little loop where each 1-wire sensor (DS18B20) coupled to a GPIO-pin are read in a sequence. Kiteyttäen: Yksi anturi per GPIO-pinni vaikuttaa mahdolliselta, mutta linkin koodi vaatisi ihan pienen muutoksen. En osaa varmaksi sanoa toimisiko. Tuossa 8-pinnin ESP-01 moduulissa on vain 2 GPIO-pinniä vedetty eli maksimissaan 2 anturia voisi mahdollisesti kytkeä. Toinen vaihtoehto on käyttää I2C-ajuria ja kytkeä siihen DS2482-800-piiri, jolla voisi lukea 8 eri DS18B20-anturia. I2C-ajuri vaikuttaa kuitenkin vielä hieman keskeneräiseltä. Pinout-kuva löytyy: http://tech.scargill.net/wp-content/uploads/2015/01/esp-201.jpg , jossa on 8 GPIO-pinniä. Nice write-up. But I have a problem. When I run the above Lua program I am getting “attempt to index global ‘ds18b20’ (a nill value). Any idea why? I’ve got the same error, but are too new to Lua to solve the problem. I’ve found some hints in http://www.factorioforums.com/forum/viewtopic.php?f=25&t=17107 bit were not able to translate it into a working ds18b20 temperature reading script. If I’m not mistaken the DS18B20 is drawn as a mirror image of the actual package in both images. The pin names are correct though; the resistor is and should be a pullup. Note that it can also be run in parasitic mode by tying VDD to GND. I’m getting “Got disconnection…” every time it tries to connect to thingspeak. It is connected to my network and gets a ip but for some reason it does not upload any data. I have set up my api keys properly. Do you have any ideas what I could try? Hi, I have the same problem, it seams that the ds18b20 is read properly, if I hold the sensor, the temp reported goes up, but, as yours, it does not save to thingspeak. I tested with same API key in a browser from my computer, and that works. So I assume that the ESP-03 is not getting to send over internet to thingspeak. Does anybody have an idea on where I must look? I also tried another s1820.lua solution on git, and have the same issue, thus suspecting esp-03 not getting onto internet ??? 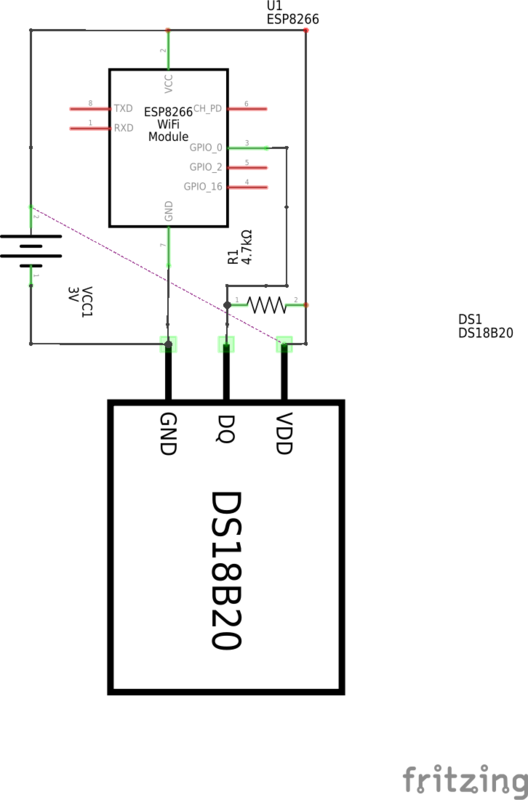 In your diagram the DS18B20 is drawn the wrong way round!! 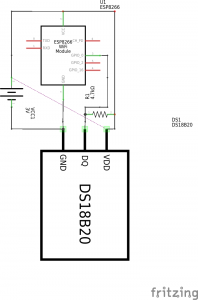 My DS18B20 got really hot when i connected it like in your diagram. The schematics was correct all the time. The part was just errorneous in the parts library of Fritzing and thus produced a faulty image with pin orders. Now fixed. Never trust computers. Hey thanks for creating this guide! I followed your instructions and it works great. Like some have already mentioned the picture shows the DS18B20 pins reversed but that was easy to correct. Now that I have the temperature posting to thingspeak I was wondering if you know how to modify the code to display F instead of C. Again thanks for sharing your work! I used this little function to do that in my dht11 module. Now fixed the image with a fixed part for Fritzing with right pin-order in the fancy looking breadboard picture also. is it because that you want to avoid the reset value that is 85°C? Now that you say that.. I have no idea why it is read twice. But maybe the reason is as you stated to skip the 85C. Or could it be just a typo on cleaning up the code and thus multiplication of a line there. Nice write-up thanks. I got 85C result before it was called twice – then I got 20C correctly, so it appears it is needed. Why there is resistor between DQ and VDD ? The resistor is a pull-up resistor for the data line. This insures that a reliable stream of 1’s and 0’s come out of the sensor. There are several examples on the Internet where there is no resistor. The data stream relies on a ‘parasitic’ voltage for the data stream, which usually works, but not always. Is this checking to make sure the send has worked? Am using the “fixed for negative values” of ds18b20.lua from here (https://github.com/sza2/nodemcu-firmware/commit/5a629e429752c5f99d1233cb133bdf614fb7d7c0) as Im wanting to use this as a freezer temp monitor. direct from the original file. Is “…” correct, or am I supposed to change this to something? FWIW, this is running direct from the programmer usb doodah – I dont have the resister / temp chip on the board yet… just wanted to see if the script ran ok before I take it out of scripting mode for the final build. Hi, thanks for your help in writing this code. Any idea on what’s going wrong ? Thanks in advance for your support ! It looks like it is about locale and the way 1.8 is interpreted. Locale specific variant could be 1,8. I have no idea on how to solve that but the ways to figure is out are in the mason-larobina github issue linked. Is it possible to avoid “require” by replacing read functions to main script?